Colavita Balsamic Vinegar "6 Star"
Colavita uses their own rating system. 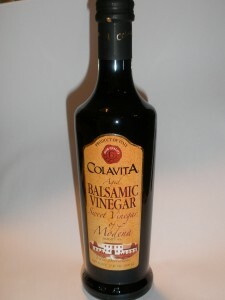 This Balsamic Vinegar has been rated a “6 star” by Colavita. I would equate the flavor and consistency to a “red label, 1 leaf” Balsamic Vinegar. The vinegar flavor and sourness is very pronounced and almost overpowers the balsamic flavor. This would be an everyday salad dressing type Balsamic versus one that I would choose for drizzling over cheeses or other stand alone uses. Description – A superior Balsamic Vinegar is determined by the quantity and quality of aged grape must used in commercial production. This special “Riserva 6 Star” contains more than double the amount of grape must required by Italian law. The “6 Star” seal is a unique quality standard developed by Colavita that promises enhanced blend of tast, sweetness, and acidity. Suggested Uses – None listed.